Hail the New Mr. Olympia! Ronnie Coleman is stunned by his own victory — witness the most unforgettable and emotional announcement of the champion in the history of this contest! Rounds 1 and 2 were as different as can be. Hail the New Mr. Olympia! Ronnie Coleman was stunned by his own victory! 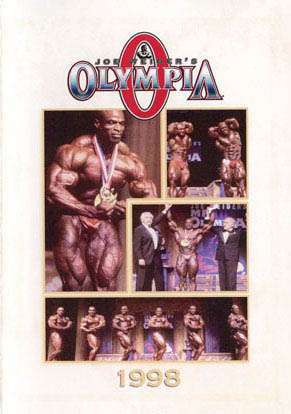 In 1998 a new Mr. Olympia was crowned. There was great excitement. Would Flex Wheeler finally take the title? Madison Square Garden theatre was sold out, with over 5,600 fans screaming and yelling for their favourite. Dorian Yates was in the house, officially announcing his retirement, which saddened many who wanted to see him compete one last time in 1999. 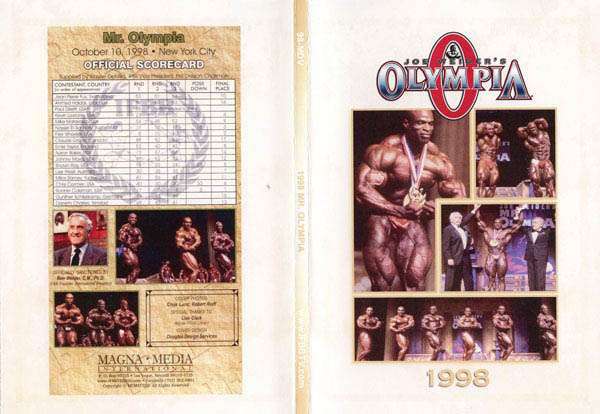 With favourites 1998 Arnold Champion Flex Wheeler, 1997 Mr. Olympia runner up Nasser El Sonbaty, and 1998 Night of Champions & Toronto Pro winner Ronnie Coleman all competing for the Sandow, everyone knew it was going to be an awesome contest. Top that with Kevin Levrone (who had won 19 IFBB Pro shows to this point), and Shawn Ray (who was 3rd last year, and competing in his 10th Mr. O), and for the first time in years, no one knew who was going to be the new champion. Sadly Dorian Yates had to withdraw from the contest three months before the event because of injury. His body had simply had enough. However the winner this evening was Ronnie Coleman, an Arlington Texas police officer, who edged out Flex Wheeler for the title. Both of these champions had awesome arms and backs, which was probably the main reason that Nasser El Sonbaty was in 3rd place, although Nasser was definitely the crowd favourite on the night. Nasser was clearly the biggest man, weighing in at 275 lbs. During the second round, Paul Dillett suffered from severe hydration, and went to a hospital to be checked out. He was ruled OK, but did not return for the evening show. After the second round, Flex Wheeler was in first place, Ronnie Coleman 2nd, Nasser El Sonbaty 3rd; Shawn Ray 4th; and Kevin Levrone 5th. How things can change. Ronnie Coleman finally overtook Flex in the 4th round, and won his first Olympia title by three points! It was an incredibly close contest – one that will be remembered for ever. This was #1 of 8 consecutive Mr. Olympia titles for RONNIE COLEMAN.